AirNav VFR uses the current Airservices Australia maps to bring you the best moving map and flight planner combination in Australia. Descriptions below quoted from the Sentient Software website, and iTunes App Descriptions. Air Nav VFR is a fully-featured flight planning package for civil and commercial pilots. 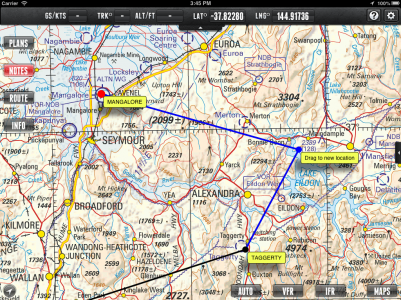 Developed by Sentient Software (http://sentientsoftware NULL.com NULL.au), it is the fast, easy and legal way to do flight planning on the official Airservices Australia charts. AirNav VFR is the only flight planner that allows you to point-and-click on the official Airservices Australia maps to plan flights. Prints your plan details including all radio frequencies automatically generated. 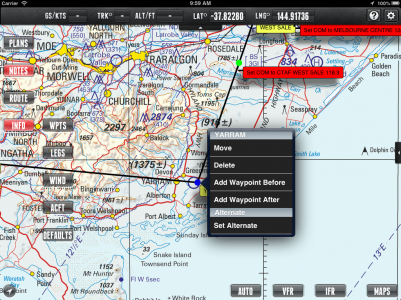 Load your AirNav route into your GPS or activate AirNav’s optional GPS in-flight Moving map feature. I was employed by Sentient Software on a part-time basis in 2013, and developed and released a number of updates for their existing iOS app (iPhone and iPad). The app was established and at v2.2 when I was hired, and from then I was the sole developer, tasked with adding new features including inflight re-planning, and additional plan information display and interactivity. The iOS app is written in native Objective-C, and additional work was also required for the PC software (C++) and server code (PHP, SQL) to support these new features. Full details for all work completed are listed below. Modifications to export additional data with the existing plan upload process, to support on-device recalculation of plan data. Bug-fixes and support as needed. 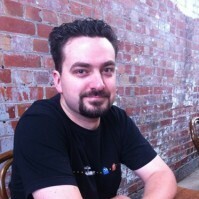 Additional scripts for SQL queries for maps, features, aerodromes, etc. Modifications to Maps download and display functionality to support legal requirements for map updates and expiry. GPS-driven notifications: Flight plans can have notes attributed to a position on the plan, to notify of an operational requirement. These notifications are now triggered when the GPS arrives within range of those Flight Notes. Support to delete files and references to downloaded maps, and flight plans stored on the Sentient Server. 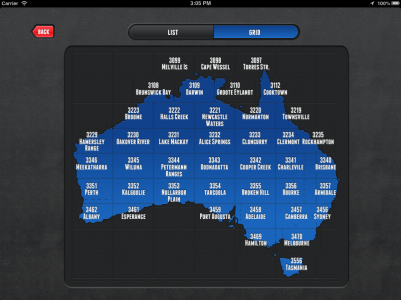 Improvements to display, sort and searching for downloadable maps and documents. UX and UI improvements and new user interfaces for new features. Support for iPhone 5 screen resolution and iOS 7. 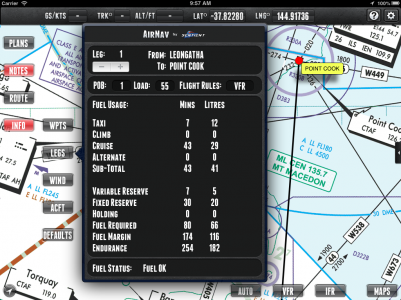 View details on waypoints, legs, refuelling, weather, aircraft and plan defaults. Optimisations in Map Loading and Display. Minor changes to support iOS 7. New Plan Creation (iPad only): You can now create a new plan entirely on your mobile device! Select the “Create New Plan” button on the plan list screen, and then tap a series of aerodromes sequentially to create your plan. Tap a waypoint a second time (similar to the PC software process) to nominate landing points and your final destination. These new plans will not be saved, and do not have all the features of the PC software, so if you’re after a fully-featured flight plan, we recommend using AirNav VFR for PC. GPS Notification of Flight Notes: Any flight notes in the plan will bring up a notification when you fly within 2nm of the flight note notification. This way you always know when a flight note is nearby! Do you have old plans in the app you won’t be flying again? Swipe to delete them from the server and the app. You can now filter through the downloadable maps by name and by type (VNC, WAC, etc.). Now you can download all the maps for a particular city or name with one click! You can now delete maps that you are no longer using. This will free up memory on your device. ERSA Support: You can now download and view ERSA Aerodrome info on the device (ERSA FAC only). ERSA documents are saved to your device, but an internet connection is needed to download/update them. Fixed some errors in LSALT calculation. Fixed a few crash bugs. Fixed a bug in the ERSA module. Thanks to our users who reported this to us. If you find any other bugs please let us know. More UI changes to support iOS 7. Some minor bug fixes and optimisations in preparation for iOS 8. Fixed an ERSA bug which caused problems loading saved flight plans and viewing ERSA documents. Added a new “Change Password” screen in settings, so users can change their registration password. Various improvements for iOS 8.